The last hurrah of the Grateful Dead, the 50th anniversary concerts in July by the surviving members, is a cultural moment. The band will be joined by Trey Anastasio, of the band Phish most famously, filling in for Jerry Garcia (gone since 1995), and Bruce Hornsby will also be there for the farewell in Chicago. Dilapidated and grey, like most of us who began to grow up in the 1960s, the Dead still evoke a time and a musical atmosphere that has long faded. After July, those times will only flare again into light for a few minutes when visiting the musical and visual record. It will be a second-hand way, but the only way, for those born too late. I was never a Dead Head — my favorite bands were the Beatles, the Who, CSN&Y, CCR and Dire Straits. 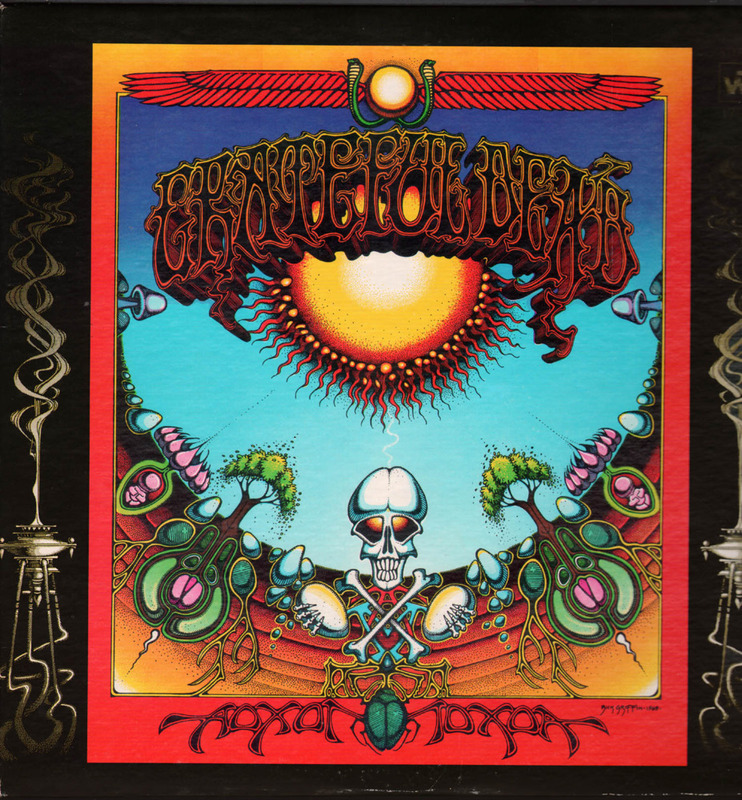 But I also listened to a lot of other bands, and I did buy The Grateful Dead’s Aoxomoxoa — the 1969 album with “China Cat Sunflower,” a song long appreciated by the Dead’s fans. I remember that at the time I didn’t like the album that much. But now I’ve begun to listen to the Grateful Dead to understand what I missed. I remember when I lived in San Francisco for a year as the 1970s rolled into the start of the 1980s, that the Dead came to town on at least two occasions. Suddenly there were wildly painted VW vans and bugs all over the place, and long-haired fans in unfashionable clothes everywhere. Crudely painted signs on cardboard asked for tickets to the shows from those who had them to give or sell. I was living pretty close to the bone, trying to write, and to learn and practice aikido and t’ai chi ch’uan. I didn’t have extra money for a band that from a distance even at that time seemed a relic of the past. I’m coming to revise that opinion now. Of course much music from the Beatles, the Rolling Stones, the Doors, the Steve Miller Band, Tom Petty and the Allman Brothers Band, among many others, will persist beyond their times. But there is something even more timeless about the Grateful Dead, in a much different way than say the long-lived popularity of the Doors’ music, who seemed to have a sensibility acceptable to those of this millenium. There’s something both quaint and perennial to be heard in the Dead’s music. Sun went down in honey. Moon came up in wine. We forgot about the time. You listen to the Dead’s recordings, you hear something of the time the band came into being, a shimmer of the west coast explosion of the Jefferson Airplane, Moby Grape, Big Brother and the Holding Company with Janis Joplin, and all the rest. But the Dead’s roots go further back, to old-time blue grass music, folk, country and gospel. The Dead’s main lyricist Robert Hunter and Jerry Garcia played together in very early days in blue-grass bands such as The Tub Thumpers. Although mainstream understanding has always denied this, the impact of psychedelic drugs, including LSD and marijuana, was to open a portal of creativity that transformed those influences into something new. Many of the bands of that era had their doors of perception opened that way, including the Beatles and many others, and with the impetus of natural musical talent, incredible music flowered. Of course, those drugs and others not so creatively inspiring such as heroin and cocaine were also a source of great danger, and Garcia himself fell victim. The most popular songs, like “Truckin'” and a “Touch of Grey,” always remain listenable to me. The song “Box of Rain” though has become one of my favorites, along with “Ripple.” I anticipate that there will be others that I come to appreciate greatly as well. But it’s “Uncle John’s Band”, a song that I always thought was catchy but disposable, that I want to learn how to play for myself now. Its structure, looking at the music on the page, is surprisingly complex. But the lyrics are evocative and meaningful to me as the band immediately begins to play in my mind. I hail the Grateful Dead as they pass. he’s come to take his children home. I wrote about aspects of this a couple of years ago (Coming of Age with the Folk Music Revival), but with the recent passing of Pete Seeger, musician and human being extraordinaire, I wanted to revisit The Weavers. 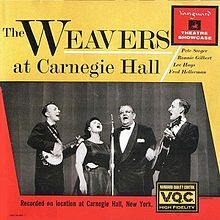 The Weavers were the arch folk group of the 1950s and even into the 1960s, with Pete Seeger as one of the main quartet, along with Lee Hays, Ronnie Gilbert and Fred Hellerman. In essence, they sparked the entire folk music revival which in time led to the emergence of Bob Dylan, Joan Baez, and many others such as Dave Van Ronk (apparently inaccurately portrayed in the recent film Inside Llewyn Davis by the Coen Brothers), of folk rock and of rock itself in the cauldron of the 1960s. The Weavers could even be seen as precursors of “world music” with their willingness to interpret and sing songs from many nationalities and traditions. It’s odd to me how little one hears these days of The Weavers or the songs they made famous, such as “Goodnight Irene” or “Kisses Sweeter Than Wine.” It’s true they are the songs from a slightly older generation than mine, and I’m getting old too. But I would still like to hear Beyoncé or Lady Gaga give them a try…. I won’t go on too much about The Weavers’ or Pete Seeger’s history — there is a lot of detailed information about all that online. But I would like to write a little about The Weavers’ meaning for me, and about Pete Seeger’s worth and appeal. 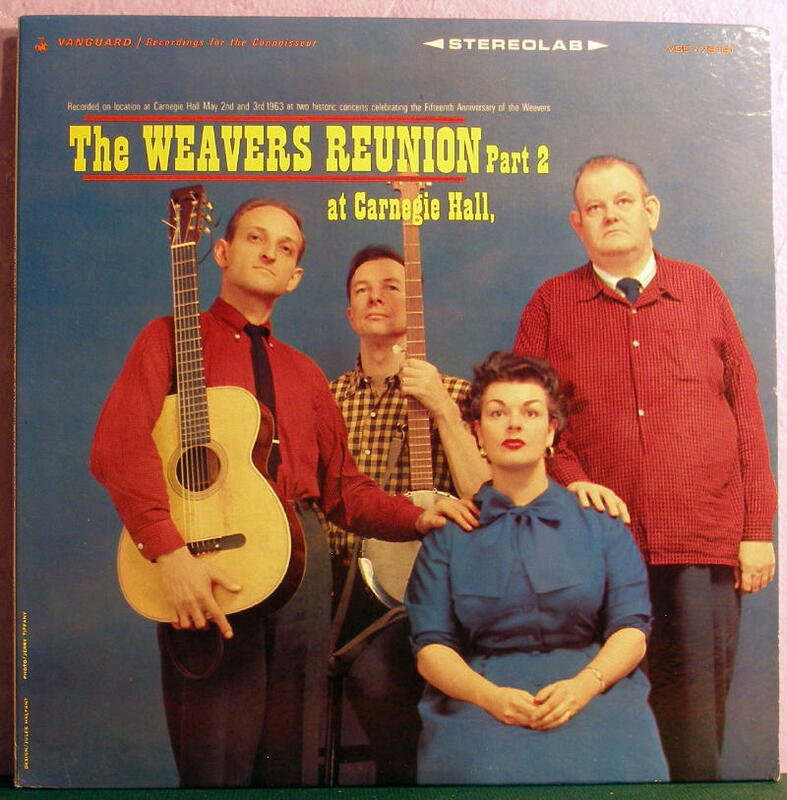 After my father died of a stroke when I was twelve in 1963, my younger brothers and I were introduced to the Weavers when our mother brought back three LP albums from a trip to Seattle. She had gone there to see her mother and to apply for veteran benefits from my Dad. There was a My Fair Lady recording of the original musical, an album of swinging Bach and other composers by the Swingle Singers on the album Going Baroque, and The Weavers At Carnegie Hall, from a 1955 live performance still considered to be one of the best and most stirring by any folk group. In central northern British Columbia where we lived on slim pickings after Dad died, it was exciting to have these brand new long-playing records. Unfortunately, at first we had nothing to play them on, and resorted to bothering some church-group friends by always taking those three albums with us and insisting that we had to listen to them. It was probably with the first veteran benefits’ cheque that Ma went out and purchased a battery-powered portable record player to listen to first those albums and then to all the many more that we, mother and boys, collected in the next few years. The record player had to be battery, because we lived for quite a few years without electricity. It strikes me now, as I recall some of this, how important recorded music was to the four of us, in a way that wasn’t quite so strong for many of our neighbours or friends. None of us in our small family were particularly musical: I struggled to play the guitar poorly, and although we all sang boisterously along with “Wimoweh” and other such songs, we were out of tune mostly I’m sure. But music is crucial to the memories of my boyhood and our lives together, and it began with The Weavers. As the three boys grew into teenage-hood, our tastes in music changed of course, to the Ventures, the Beatles, then Neil Young, the Rolling Stones, and of course eventually Dan Hicks and the Hot Licks! So after those early times, although we might still go back to listen occasionally, The Weavers and Pete Seeger faded from our preferred listening. I would hear about Seeger from time to time through the years, usually as an activist during the civil rights and anti-war movements in the States, with his anthem “We Shall Overcome” (derived from a gospel song), and would sometimes listen to his songs “If I Had a Hammer”, “Where Have All the Flowers Gone,” and “Turn! Turn! Turn!”, usually performed by others. Later, in the last few years, his status as the grand old man of folk only grew. Bruce Springsteen produced the “Seeger Sessions” and tour, dedicated to many of his songs. Seeger’s album At 89 won a Grammy in 2008. There are the performances on Youtube like a rousing one from 1993, “If I Had a Hammer”, with Arlo Guthrie. He could always get audiences to respond to him, to form impromptu communities of song around his presence. At first the audience is hesitant and quiet. We look at Seeger from the rear, a lone wooden chair on the stage, a spotlight beaming down, the audience in darkness beyond him. The audience begins to join in a little; Johnny Cash comes striding into the scene with his guitar, adding his voice. Pete waves his arm briefly at the audience, but so sure, as if it would automatically connect him with the people in front of him, and it does. They begin clapping, they start to smile, their voices rise. Pete calls out “You know, these old songs, they’re never going to die…. This song, it’s the whole human race! …But you got to have hope….” The two men tear into the last verse, playing face to face, and the audience claps and cheers as they finish. You can see Pete vibrating with song, moving his feet a little, bending his knees, singing his heart out. For those moments, he embodies the song, and its recognition of struggle and perseverance shines out of him. He’s gone now. That embodiment has given way. The songs go on. 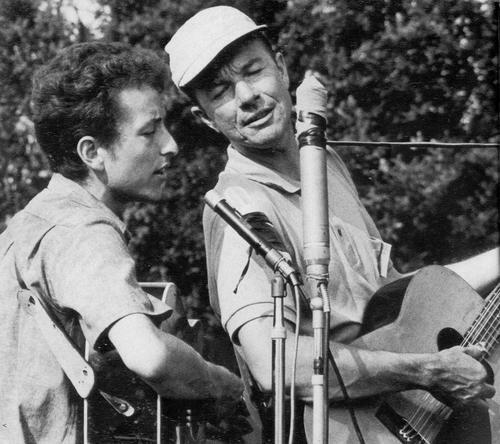 Note: The photo of Bob Dylan and Pete Seeger is from the Broadsheet website. My familiarity with her writing is not through that book or through some feminist lens, but by bumping up against her more esoteric and science fictional writings. Lessing herself has called the book “inner space fiction — for there is never anywhere to go but in.” In brief, the story is about an educated man, a sensitive man, sensitive and perceptive perhaps of a wider universe than we are usually aware of, and his treatment by psychiatrists and the medical establishment with drugs and contradictory methods that reflect the narrow world of the conventional in society and science. There is much more to it than that, of course, which the reader may determine to examine on their own. When I heard of her death, I realized I wanted to experience again the unadorned clear independence of her voice. I came across this series of lectures, a collection of essays really, from 1985, called Prisons We Choose to Live Inside, only 76 pages long. They form one series of what are called the Massey Lectures, which are in part sponsored by the Canadian Broadcasting Corporation (CBC), analogous to Britain’s BBC. The Massey Lectures typically are a venue for various intellectuals and writers, such as Margaret Atwood, R.D. Laing and John Ralston Saul. They were, and are, something like TED lectures before the Internet allowed that forum to be. The first lecture is entitled “When in Future They Look Back On Us”, and sets the tone for the other four essays. A lot of her focus is on the irrationality of what we humans choose to believe and to act on. She tells stories of a farmer who slaughtered a prize bull for in effect, being a bull, or a tree “executed” for being associated with a disgraced general. She wants to strengthen her historical, objective eye, she says, so she has considered long and hard this matter of how we might seem to people who come after us. She notes that the passionate and powerful convictions of one era can be completely overturned in the next. Lessing gives the example from the Second World War, while the Soviet Union was deemed an ally against Hitler, how affectionately that country was regarded in popular opinion. During the ensuing Cold War, of course that kind of feeling became completely un-American and considered treasonous. Lessing, although born in what is now Iran, grew up in Rhodesia, now Zimbabwe, in southern Africa. She moved to London when she turned 30. She returned much later to Zimbabwe after what was in effect a race war there “that was very much uglier and more savage than we were ever told.” Lessing found that many, especially former combatants on both sides, appeared to be in stunned, almost blank states of shock. She attributed this to the participants’ knowledge of what we as humans are capable of, and the difficulty of taking this in. But for the purpose of her discussion, the more interesting fact was that many fighters on both sides, black and white, had thoroughly enjoyed the war. It enabled them to put qualities they valued to full use in the midst of extreme brutality. I have even experienced this, or something like it, on the verge of a riot, although still far away from the strength of passions that give rise to war. After wars of course, everything becomes sentimentalized, and no one really speaks truly of the physical and psychological damage caused both to the soldiers and civilians. Perhaps a sign of the damage is how difficult it becomes to address it. We are left with the subtle glorifications of war that go on constantly and culminate each year in such rituals as Veterans Day. Lessing says: Beware talk of “blood” in public or political discourse — it is a sign of reason about to make its departure. Lessing notes psychological experiments that were well known even at the time of these essays that show how easily people can fall into the traps that catch mobs. She cites one experiment where a large number of people from a town adjoining a university were invited to a large open area by a team of psychologists. The townspeople showed up, but the psychologists couldn’t be found. Two camps formed as to what the situation was and what needed to be done. Conflict arose, tempers flared. Young men started pushing and shoving. After this rather arrogant social experiment, one of the psychologists came forward. As Lessing describes it, the psychologist said, “You, the crowd, have only been here for a couple of hours and already you are separated into two camps, with leaders, and each side sees itself as a repository of all good, and the other camp as at the best wrong-headed. And you were on the point of fighting about absolutely non-existent differences.” And there are similar experiments that come to my mind about how simply putting a colored armband on people easily leads to division, strife and suffering. The entire point of her lectures, Lessing says, is that we should not be surprised by this behaviour and all the examples of similar mis-applied passion. This should be expected. But we should “build what we know from history and from the laws of society we already have into how we structure our institutions.” Unfortunately she does not go into great detail into how this might be done. Lessing describes her own time as a young woman when she became for a while a devout communist, and the groups of which she was a part believed that because of communism, everyone in the world could soon be living in harmony, love, plenty and peace, forever. Brainwashing goes on all the time, through three common processes. The first is tension followed by relaxation, as in the example of the Good Cop and the Bad Cop alternating during an interrogation. The second is repetition, saying the same thing over and over again. The third is the use of slogans or catch phrases — the reduction of complex ideas to simple, easy repeatable, sets of words. Governments, corporations, religious groups use these all the time. This has become almost a common place observation, now, in our world. It can be observed in every election. And what, we might ask cynically, is a possible response to this? “It means, and I hope that this won’t sound too wild, choosing to laugh…. The researchers of brain-washing and indoctrination discovered that people who knew how to laugh resisted best. … Fanatics don’t laugh at themselves…. Bigots can’t laugh. True believers don’t laugh. Tyrants and oppressors don’t laugh at themselves, and don’t tolerate laughter at themselves.” I think of Putin here, for some reason. Lessing observes: “It is the hardest thing in the world to maintain an individual dissident opinion, as a member of a group.” There are many psychological experiments which show how easy it is to sway the individual when a group thinks differently but is incorrect. As her own experiment (and as a good example of her rebellious and contrary spirit), Lessing wrote two books under the assumed name of Jane Somers. The books were submitted to publishers and critics. She says that she deliberately sent copies of the books to all the people who considered themselves experts on her work. Not only were the novels not recognized as Doris Lessing’s works but they were described in the most patronizing ways. She goes on to mention the famous Milgram psychological experiments where people comply with instructions to give increasing shocks to people who eventually start shrieking with (simulated) pain behind a curtain before they fall ominously silent. She notes that it is hard to imagine any government or political party allowing an education that might help to free people from governmental and state rhetoric and persuasion. On the other hand, there don’t appear to be any democratic movements either that make a point of educating their membership about what is well-known about crowd psychology, group psychology. In the end, Lessing was hopeful that as was happening in some places during the eighties, some countries that were tyrannies and dictatorships were moving to democracy such as Spain, Brazil and Argentina. There is much more nuance in her discussion than I am able to indicate here, but what struck me the most was that if we really cared about democracy, the environment (which Lessing doesn’t touch on at all), and an equitable economy, we would be teaching our children what is already known in quite factual ways about the human animal and how it behaves and how it is influenced. 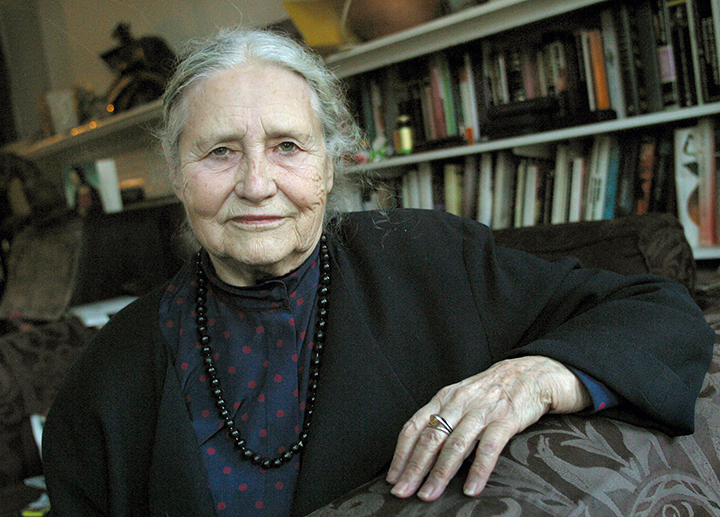 The photo of Doris Lessing is from a site called Tacno.net. For a good overview of the ideas of William Irwin Thompson, an article by him called “It Has Already Begun” at the Context Institute website shows off in fairly concise form some of the insights and surprising turns of Bill’s “mind-jazz.” It was written at about the same time as these lectures or essays of Doris Lessing. To me now, it reveals two things: 1) the great optimism and breadth of Bill’s vision about “planetary culture”, and his hope for it despite ourselves and 2) how sometimes he would force events or trends he observed into a vision that he would have to twist around to accept those observables. This article was written in the era of Reagan and before the Soviet Union succumbed. His observations about Reagan, as one example, are pretty thin to me…. But “civilization as militarization” certainly rings true. Note: November 20, 2013, added the Henry Beston quote….